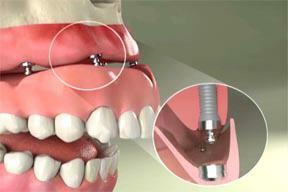 A dental implant is an artificial tooth root that is placed into the jaw to hold a replacement tooth or teeth. Dental implants are an ideal method of tooth replacement for people in good general health who have lost a tooth or teeth due to an accident, periodontal disease, severe decay or some other reason. Dental Implants became popular in the late 1980’s in the United States and Dr. Edalat was at the time a tenured clinical professor at New York University College of Dentistry which gave him the opportunity to be in the hub of Dental implants research and advancements. The vast experience and knowledge that his team possesses from nearly 40 years of teaching and clinical cases distinguishes this team and is a source of confidence for their patients who realise the complex nature involved in dental implant procedures and the importance of working with certified professionals in this dynamic field. Maintain the volume and density of the available bone after tooth loss. research and clinical studies have shown that if an implant is not placed after tooth loss, the jaw bone where the tooth is missing will continue to atrophy just like a muscle might if it is not in use, meaning there will be bone loss due to what is called disuse atrophy. Putting implants in place of a missing tooth or teeth will ensure that the bone is stimulated and under use therefore the volume and density of bone is maintained. Since the bone is maintained the facial muscles are also maintained in their healthy natural appearance, therefore the patient will not show the signs of precocious aging that is most often seen with denture wearers such as exaggerated para labial folds and wrinkles. 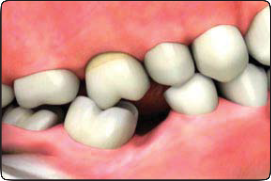 Practicing the biomimetic approach by preserving the health of the adjacent teeth- Since there is no need for crown and bridge work, the neighboring teeth are not altered and reduced in size, therefore there are none of the potential associated complications seen with crown and bridges such as tooth sensitivity, tooth decay , root canal therapy and even possible tooth loss due to the above mentioned risks and complications. Improved ability to speak, eat and smile in comfort and confidence, thus improving both the social and professional life of the individual. eliminate the use of one of the most uncomfortable prosthesis in dentistry which are the full and partial dentures. For fully edentulous patients there is an option to wear a denture but one that is “locked in” to implants placed in the jaw, so that the dentures are secure, therefore there is no need to use adhesive pastes to keep the implants in place. 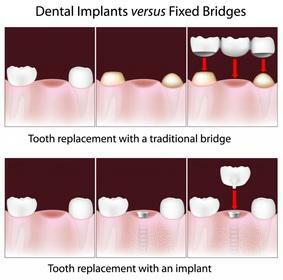 One of the most significant benefits of restoring missing teeth with implants instead of dentures is the individual is able to chew more efficiently using heavier bite forces, thus being able to maintain a healthier well balanced diet such as foods that are harder to eat with a denture such as meats and vegetables and consuming less softer foods like carbohydrates which may lead to obesity. Therefore, the often associated symptoms of malnutrition seen by most denture wearers is eliminated and the life expectancy of the individual is improved. compared to traditional dentures, Implants look and feel more like natural teeth thus improving the facial profile and overall face dental aesthetic composition. In Dr. Edalat’s dental studio Cosmetic Dental Specialties they have been successfully placing implants and restoring smiles since 1982 . The procedure is done under local anesthesia and if necessary, the patients use conscious sedation, which is a state of sedation characterized by a minimally depressed consciousness where the patient remains responsive but more relaxed and comfortable during the procedures. Before and after photos showing the missing central incisor replaced by an implant restoration. The photo above demonstrates severe bone loss after multiple missing teeth: facial disfigurement accompanied by the appearance of premature aging. 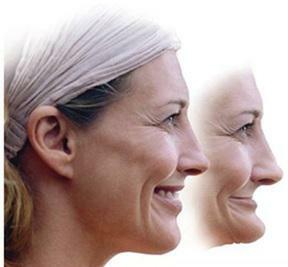 Dr. Edalat’s SMILE REJUVENATION TREATMENTS reverses the again process by restoring the bone loss and tooth loss. The SMILE REJUVENATION TREATMENTS restores the faciodental composition and harmony, thus reversing the aging process. The goal is to redefine a smile line that matches the unique character and personality of the patient. Losing a tooth can be devastating, not only because it affects the way you look, but also because it can lead to other physical problems that may affect your health and prevent you from smiling with confidence. Jaw joint problems including pain, discomfort, headaches, neck aches, limited jaw opening, among others. Difficulty in chewing properly which may cause malnutrition and subsequent decreased life expectancy along with increased risk for systemic diseases such as obesity, high blood pressure, diabetes, heart disease, stroke, etc…. Additional stress on the remaining teeth, with potential bone loss around the remaining teeth over time. Social life and professional life may be affected. An important factor to obtain optimal results and long term success is the choice of the dental prosthetic laboratory that the dentist employs. Dr. Edalat has been working with internationally recognised master ceramists and dental technicians which play a vital role in the success of each individual treatment, both aesthetically and functionally. Using detailed communication with photographs, videos and in lab visits with the patient, the triad team of dentist, patient and dental technicians are able to achieve optimal results and minimise complications in the long term. Prior to starting any major restorative work it is most important for the dentist to create a well established and detailed sequence of the Ideal Treatment Plan: Depending on the complexity of the case it may take several days for the doctor to study, analyse and create the ideal treatment plan. Using diagnostic tools such as conventional radiographs, CAT scans which are three dimensional computerised radiographs, study models and aesthetic wax ups of the desired final result the ideal treatment plan is established. Dr. Edalat explains in detail the advantages and disadvantages of each treatment option so the patients can make an educated and informed decision as to which treatment plan is more suitable for their particular case. Since there are more than 54 variables which will determine the ideal treatment plan this stage is crucially important to guarantee the success of the treatment rendered and minimise any potential complications which are inherent with any implant system. Once the ideal treatment plan is decided by the doctor and patient the next step is to restore the available bone volume and density prior to placing any implants. Since the surrounding bone is the foundation of the implants and will determine the functional and aesthetic success of the treatment rendered. It is common to perform various bone graft surgeries and plastic surgeries of the gums prior to or in conjunction with placing implants. This is another outstanding differentiating factor of Dr. Edalat’s team as they are certified specialists in both the surgical and prosthetic aspects of dentistry, with all procedures being performed in the same office by the same family team, this improves the success of the treatments since the communication is enhanced by the family team, thus there is less chance of miscommunications between dental specialists working from different offices. Once the available bone is ideal in volume the implants may be surgically placed and they are allowed to heal and integrate with the bone over a 4-8 month period depending on the complexity of the case. 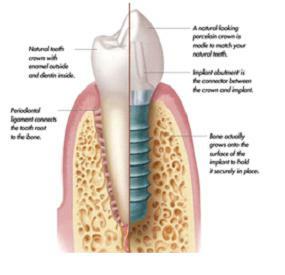 In some cases the implant may be immediately loaded after being surgically placed in the bone. Since immediate loaded implants may have a higher failure rate the case must be carefully studied in detail by Dr. Edalat. Once the implant has healed with the bone the restorative phase can begin with the placement of an abutment pillar on the implant and over the next few visits eventually placing the tooth (porcelain or ceramic crown) on the pillar. Additional plastic surgeries of the gums or bone grafting surgeries may be necessary to enhance the aesthetic final result or functional aspect of the implant system. In such cases the patient will be advised of additional treatments and costs involved. Once the treatment is completed Dr. Edalat’s team advises the patients on the importance to return for maintenance visits, regular cleanings and preventive check ups to ensure the balanced harmony of the implant system and its success for the long term. 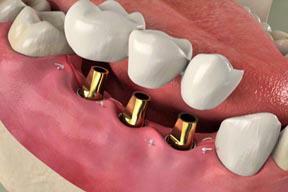 For the surgical placement of the implants, your mouth is thoroughly numbed. 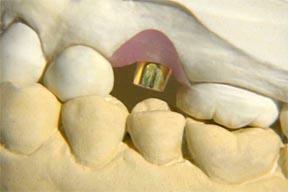 An incision or small openings are made in your gums, and a channel is shaped in the bone to receive each implant. Next we place the bodies of the implants into the prepared channels. 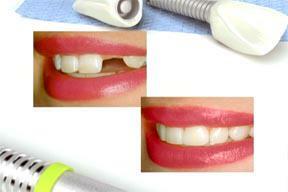 Sometimes covers are placed on the implants, and the gums are stitched closed. This method is called a two-stage procedure. 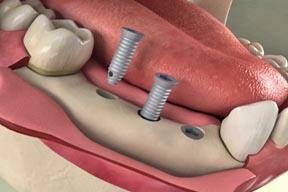 In other cases that allow a single-stage procedure, extensions are attached to the implants at the time of the surgery. Healing may take several months as the implants become fused securely to the bone. During this time, we may place a temporary replacement bridge. Though some of the steps might be different in your case, they usually include removing a temporary bridge and taking impressions of your mouth. 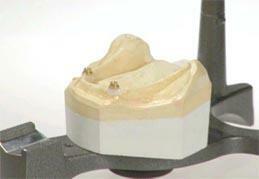 The lab uses the impressions to make an accurate model of your mouth, including the implants. 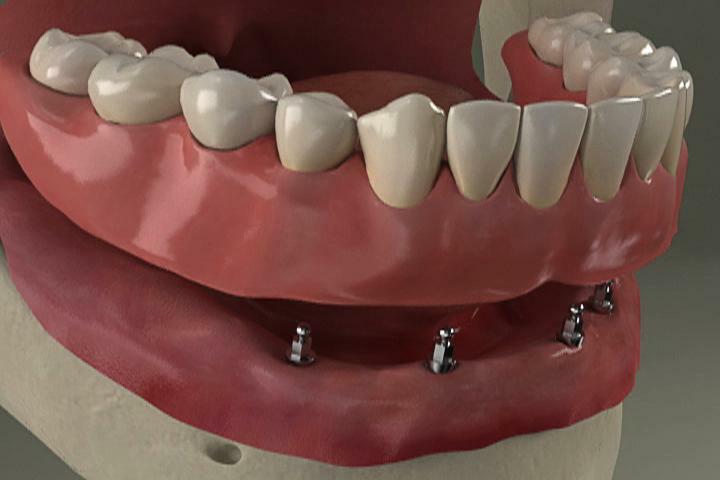 They use the model to create a bridge that fits the implants and your bite. 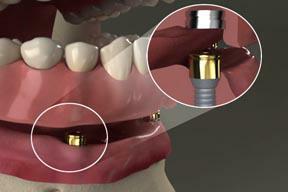 A healing cap or an extension is attached to the implant. We then close the gums. Over the next several months, the implant will become fused securely to the bone. During this time, we may place a temporary replacement tooth. 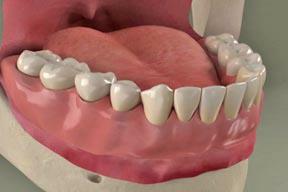 Dentures attached to implants have several advantages. The implants slow or stop the loss of jawbone that occurs when teeth are missing. 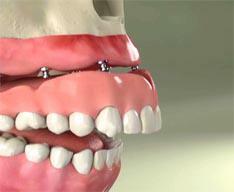 The dentures are stable in the mouth, which makes it more comfortable to talk and chew. 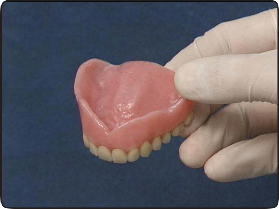 And the dentures are removable for easier cleaning and checkups. Next, we place the bodies of the implants into the prepared channels. 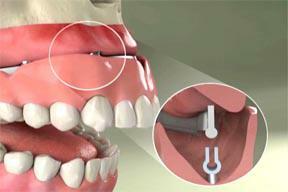 Covers are placed on the implants, and the gums are often stitched closed. During the healing period, you might wear a temporary denture, or your own denture may be modified to fit over the implants. Healing may take several months as the implants become fused securely to the bone. The next phase starts with a series of appointments to create your final denture. 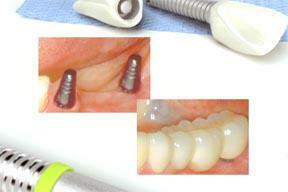 Though some of the steps might be different in your case, they generally begin with gently exposing the implants. Then we take impressions and bite registrations of your mouth. 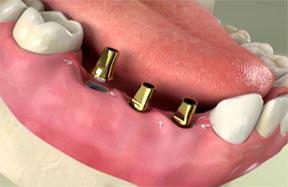 Upper dentures retained by implants have several advantages. 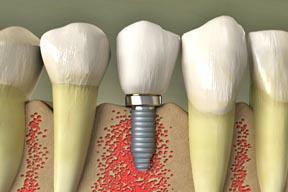 The implants slow or stop the loss of jawbone that occurs when teeth are missing. 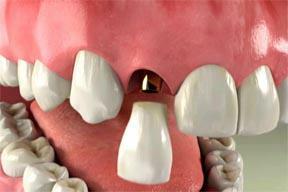 The dentures are stable in the mouth, and often they can be shaped so they don’t cover the palate. This makes it easier to talk, chew, and taste your food. And the dentures are removable for easier cleaning and checkups. With proper homecare and regular checkups, your implant-retained denture can provide you with a secure and natural-looking smile. The lab uses these records to make an accurate model of your mouth, including the implants. They use the model to create a final denture that precisely fits the implants and your bite. After the denture is complete, we place it onto the implants, check the fit and your bite, and you have your beautiful final denture. To reduce discomfort or swelling, rinse your mouth three times a day for two weeks with warm salt water. Use about one teaspoon of salt per glass of warm water. It’s normal for your gums to be sore and swollen for a few days. One of the keys to Dr. Edalat’s outstanding dental practice is the careful selection of his dental prosthetic laboratory which is responsible for half of any restorative work. The internationally recognised works of Dr Edalat’s master ceramist are the fruit of more than 20 years of dedication practicing and teaching at prestigious dental schools internationally, catering to the elite dental professionals and their most demanding patients, and coauthoring books on the advanced aesthetic techniques. Members of the prestigious Oral Design International Foundation, The American society for Dental Aesthetics, and the Dental Laboratory Association of New York. Recognised as one of the preeminent instructors of advanced oral design techniques in the world. Director and clinical professor at the prestigious New York University College of Dentistry continuing dental education course entitled “ Mastering Aesthetics and ceramics”. The cost of any dental treatment varies depending on several factors such as : The experience, technical knowledge and artistic sensitivity/talent of the dentist, his master ceramist and dental technicians involved. 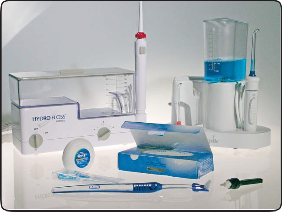 Also the dental materials which are used including the manufacturer of the dental implants and its different acessories, and the material used by the dental laboratory such as the type of metals and ceramics employed. Finally the perceived value of the doctors work and his lab technicians also determine the price range of the proposed treatment. Therefore it is important for the patient to take into consideration the above mentioned variables when deciding on the dental professional they choose to trust for their oral health care. Brush your implants with a soft toothbrush, and floss them thoroughly every day. We may recommend special floss, brushes, mouthrinses, or other cleaning aids to keep the area free of bacteria. Brush and floss your tongue, gums, palate, and any remaining teeth twice a day to keep them free of plaque and bacteria.